The allure of azure color makes this three stone ring an easy choice for your next jewelry purchase. Apples of Gold makes a beautiful combination with blue topaz gemstones and a white diamond, which makes this piece brilliant and affordable. The center white diamond measures 0.25 carats and expertly catches light, while the side blue topaz gemstones, which measure 3.5mm, add their own touch of rich color. The stones are set in a white gold mounting which leads into the polished white gold band. 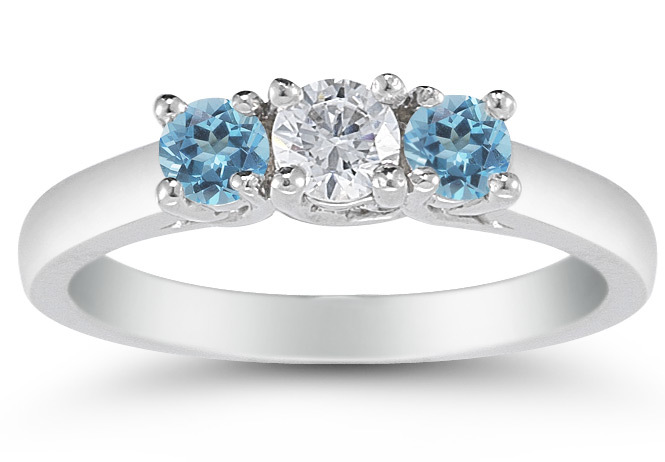 We guarantee our Three Stone Diamond and Blue Topaz Ring, 14K White Gold to be high quality, authentic jewelry, as described above.